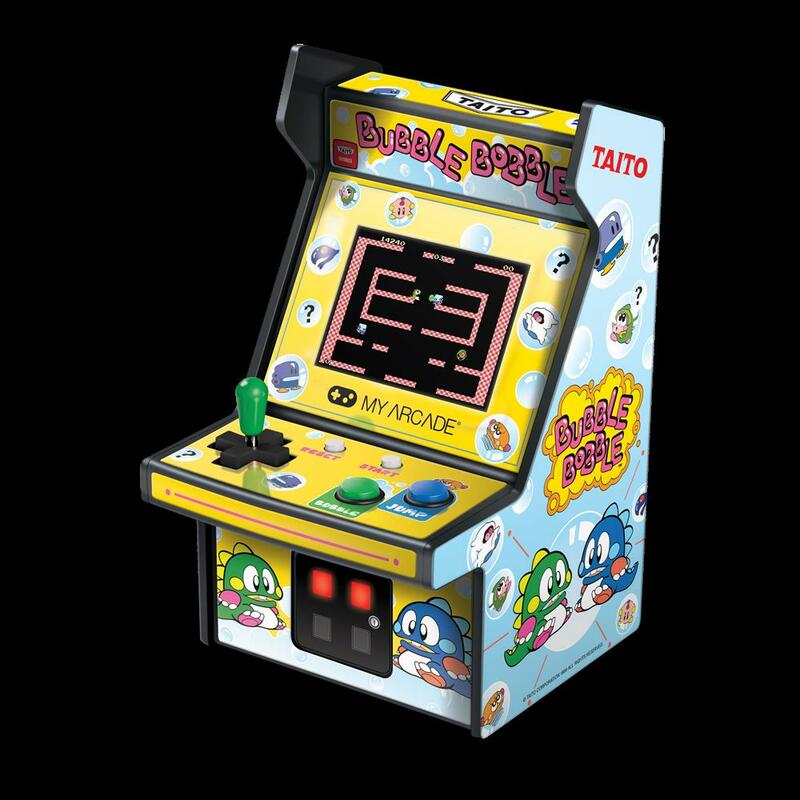 Bubble Bobble and Elevator Action Micro Players: The same arcade cabinets that gamers know and love, scaled down to 6.75” for desktop play. Each Micro Player features artwork inspired by the original arcade cabinets as well as a full color, 2.75” screen with volume control and 3.5mm headphone jack. 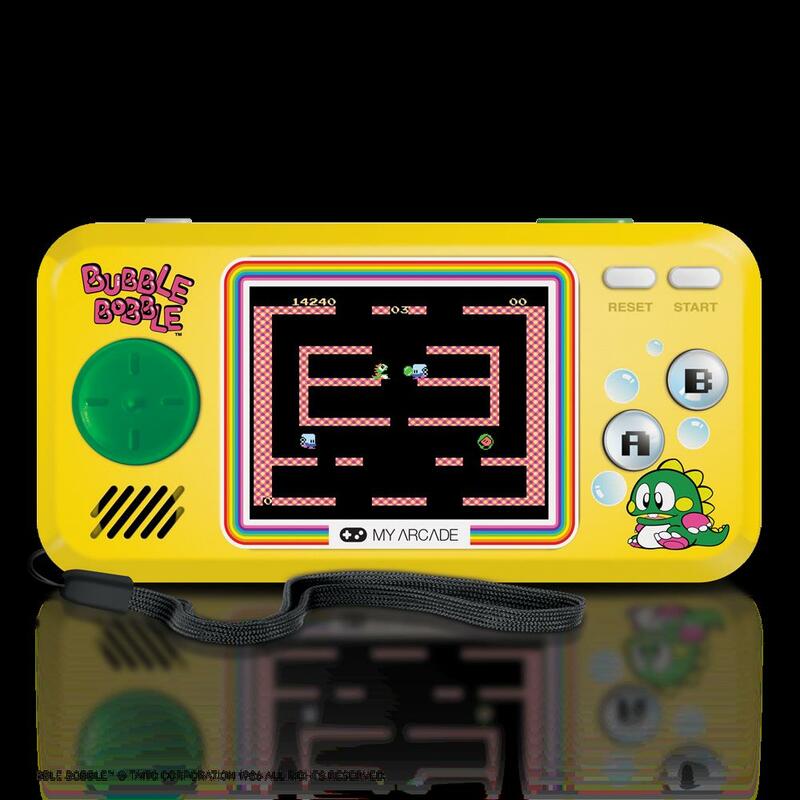 Bubble Bobble Pocket Player: Now gamers can get their retro fix on-the-go with the iconic titles Bubble Bobble and hard-to-find cult classics Bubble Bobble™ Part 2 and Rainbow Island™. 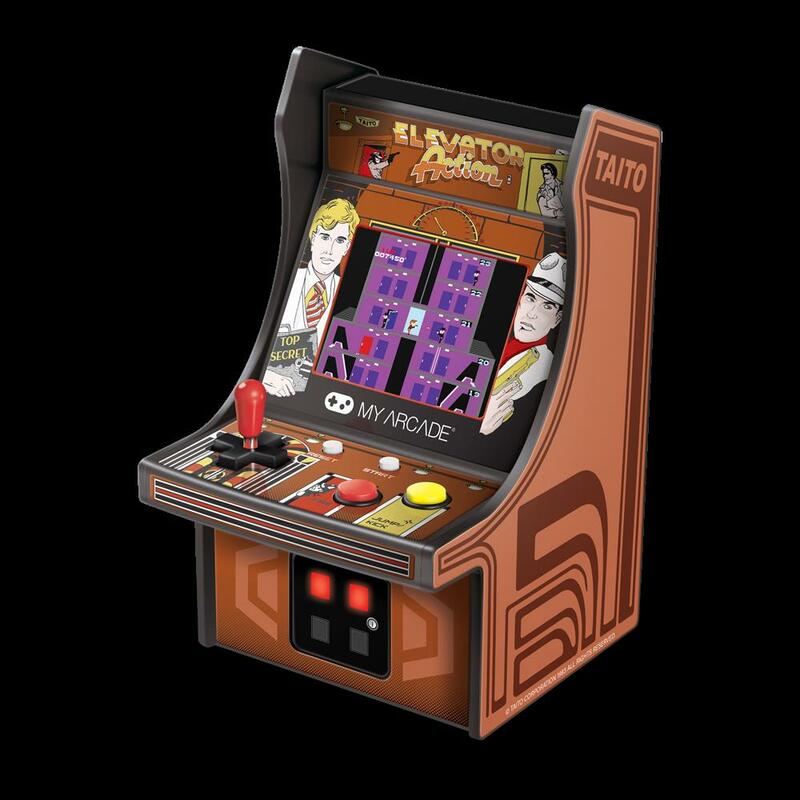 These TAITO classics are available in portable format on My Arcade’s signature Pocket Player, featuring a 2.75” full color screen and ergonomic design. 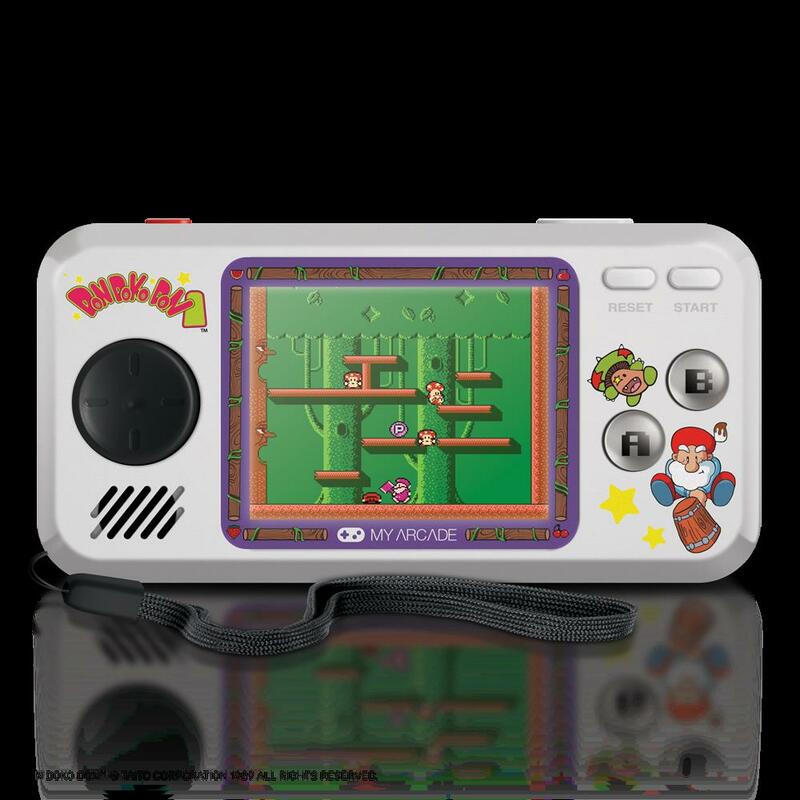 Don Doko Don Pocket Player: For the first time on a handheld in the West, Japanese platform adventure game Don Doko Don and its sequel, Don Doko Don 2™, are available along with the quirky classic Chack’n Pop™. Players can enjoy hours upon hours of exciting action and challenging gameplay in a convenient portable format. 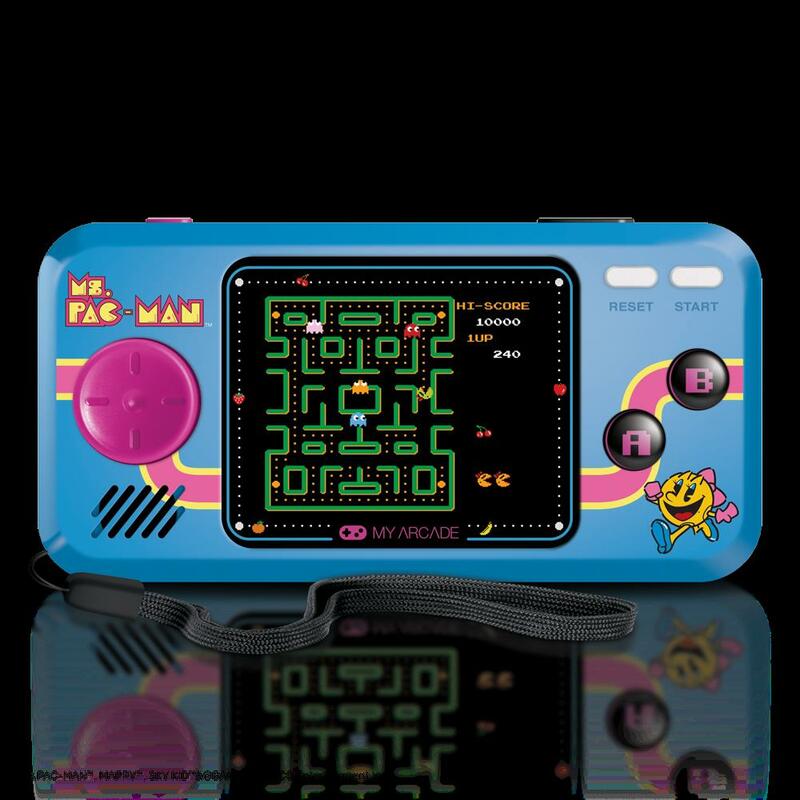 PAC-MAN® Micro Player: Scaled down to 6.75” for desktop play, the Ms.PAC-MAN® Micro Player features artwork inspired by the original arcade cabinet as well as a full color, 2.75” screen displaying 8-bit graphics with volume control and 3.5mm headphone jack. PAC-MAN® Pocket Player: This new Pocket Player includes fully playable 8-bit versions of Ms.PAC-MAN®, SKY KID®, and MAPPY® games. 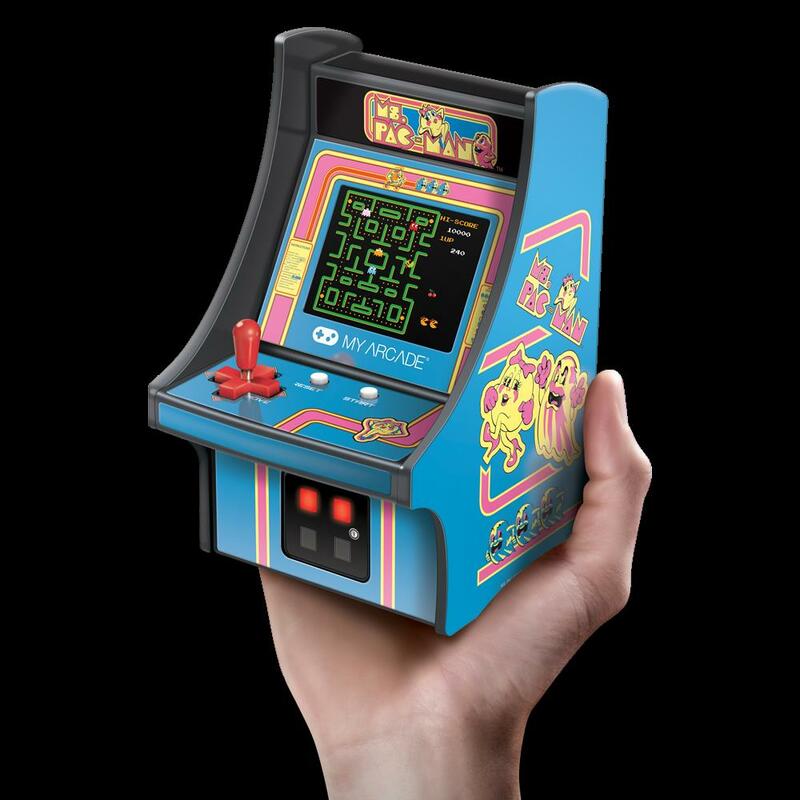 Featuring a full-color 2.75” screen to brightly display Ms.PAC-MAN® in all of her 8-bit glory, My Arcade’s signature Pocket Player is fine-tuned for hours of play through its emphasis on ergonomics and compact design. 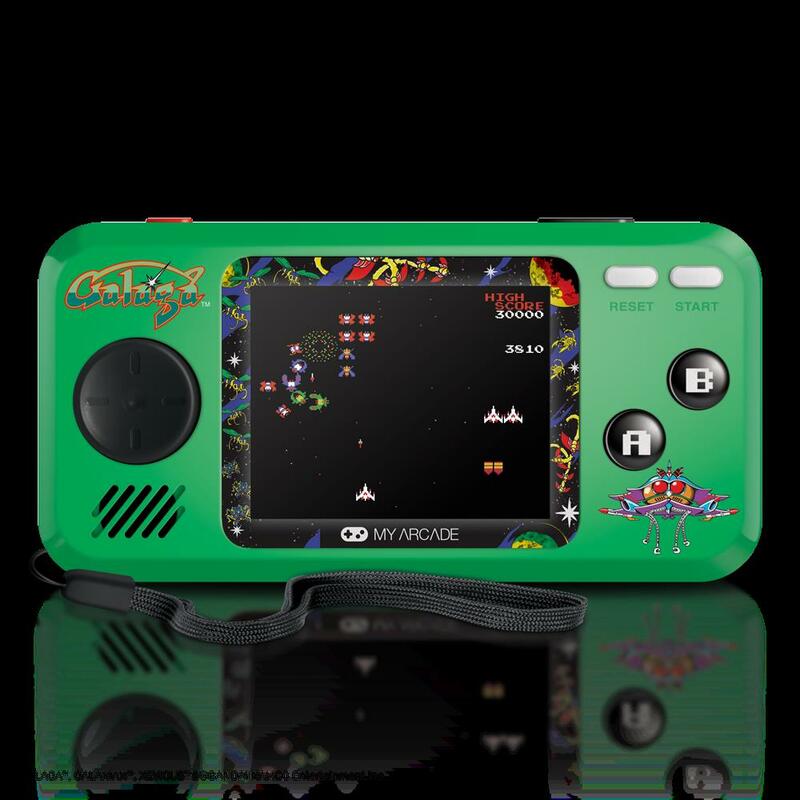 GALAGA® Pocket Player: Shooter fanatics can now enjoy three out-of-this-world classics, GALAGA®, GALAXIAN®, and XEVIOUS®, on a compact game system perfect for retro gamers on-the-go. 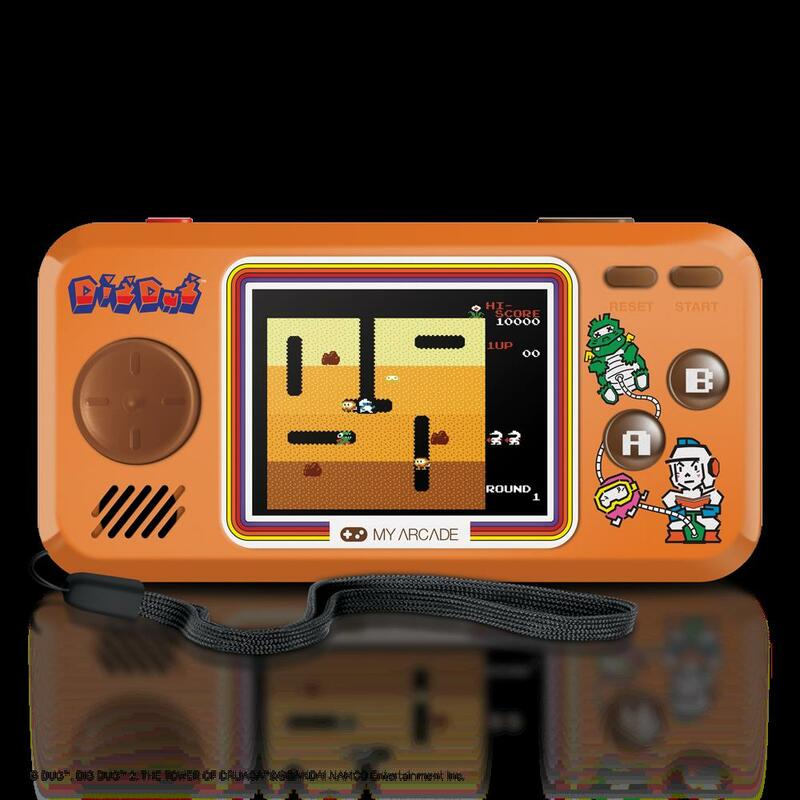 DIG DUG® Pocket Player: Enjoy all time classic DIG DUG® and its lesser known sequel, DIG DUG®ll , join cult favorite THE TOWER OF DRUAGA® in an epic handheld which is sure to provide hours of enjoyment. The Retro Champ Console breathes new life into retro gamers’ NES and Famicom cartridges without the need for a legacy console. My Arcade’s new console includes a built-in 7 inch screen that allows for portable play with 35 hours of playtime via the built-in rechargeable batteries. Retro gamers looking to play from the comfort of their couches can connect the Retro Champ to their TVs via the console’s HDMI output and pair with My Arcade wireless controllers (sold separately). Also included is a built-in cartridge cleaning kit — no more blowing on cartridges! The device is ideal for game collectors, cartridge hunters, and convention/expo goers that need a portable device to test potential new purchases. My Arcade is expanding its signature line of classic gamepads to include a wireless controller for the recently launched PlayStation® Classic. The Turbo Gamepad™ boasts a programmable TURBO feature with LED indication and rechargeable built-in battery for over 15 hours of play per charge. Hopefully John will bring us some additional images and hands on from the show floor later this week. My Arcade, the industry-leader in retro gaming accessories and collectables, reveals its latest lineup at CES 2019. This is headlined by My Arcade’s new partnership with TAITO Corporation, which introduces a new line of Pocket Players™ and Micro Players™ for iconic titles Bubble Bobble™, Elevator Action™, Don Doko Don™ and more. My Arcade’s CES lineup also includes an extension of their partnership with BANDAI NAMCO Entertainment Inc., an all-new Retro Champ™ Console that plays both NES and imported Famicom cartridges, and the Turbo Gamepad wireless controller for the PlayStation® Classic. CES 2019 attendees can go hands-on with all of My Arcade’s new products at their booth at South Hall 1-21030. Members of the press based in Europe interested in scheduling a personal demo can contact alex@littlebigpr.com for an appointment. My Arcade’s new retro gaming hardware and accessories will soon be available for pre-order on MyArcadegaming.com and is expected to launch later this year. Details on the full lineup can be found below. My Arcade expands its partnership with BANDAI NAMCO Entertainment Inc. to introduce one of gaming’s first and most iconic female protagonists, Ms.PAC-MAN®, to My Arcade’s line-up of accessories. The CES 2019 lineup from My Arcade will be available by summer at MyArcadegaming.com, Amazon.com, and select retailers.